Provides detailed performance information using the tools of benchmarking to measure the various Lisp systems, and provides an understanding of the technical tradeoffs made during the implementation of a Lisp system. This final report of the Stanford Lisp Performance Study, conducted over a three year period by the author, describes implementation techniques, performance tradeoffs, benchmarking techniques, and performance results for all of the major Lisp dialects in use today. A popular highlevel programming language used predominantly in artificial intelligence, Lisp was the first language to concentrate on working with symbols instead of numbers. Lisp was introduced by John McCarthy in the early 1960s (McCarthy's LISP 1.5 Programmer's Manual published in 1962 is available in paperback from The MIT Press) and its continuous development has enabled it to remain dominant in artificial intelligence. The study is divided into three major parts. 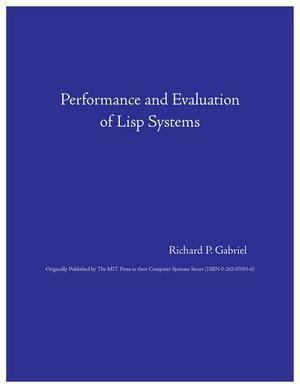 The first provides the theoretical background, outlining the factors that go into evaluating the performance of a Lisp system. The second part presents the Lisp implementations: MacLisp, MIT CADR, LMI Lambda, S-I Lisp, Franz Lisp, MIL, Spice Lisp, Vax Common Lisp, Portable Standard Lisp, and Xerox D-Machine. A final part describes the benchmark suite that was used during the major portion of the study and the results themselves. Dr. Gabriel contributed to the development of Lisp and other infrastructure used by the artificial intelligence community. His contributions to the definition of the Common Lisp Object System set the stage for many object-oriented language features that were ahead of their time. He helped to develop Smalltalk and other infrastructure used by the object-oriented programming community, and has been influential in the ACM OOPSLA conferences, for which he created the Onward! Track to look for the next big advance in object technology.